This mantel feels a bit more earthy than my Batty Turquoise mantel from last week. The free eye chart printable from Jen at Tatertots & Jello had to make a return because I love it so! I'm not really into "gory" Halloween, hence the pumpkins and "candy corn" vase, but I did add a touch of fright with the skeleton banner. Just a tiny, baby fright, really. The pumpkin art tutorial is here. The candy corn inspired vase is a yellow vase I already had, which I covered with a strip of orange burlap and a strip of cream burlap. The strips are held in place with thick twine. The banner is made from my Fall banner, which I turned around so the word "Fall" wasn't visible. 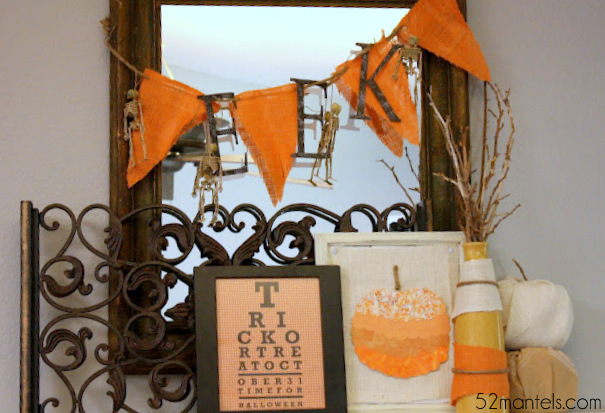 I picked up the skeletons at the dollar store and stuck them in the banner with cardstock letters spelling "EEK". My vase is filled with sticks I found in our yard. They add the perfect amount of height and contribute to the earthy vibes going on with this mantel! I love the "candy corn" cannister!! My gosh, so many cute ideas!! Thanks for the blog award--that was very nice of you! REALLY cute!! I love it! I could look at Halloween decor all day!! Looks great! You are so talented ~ mantles are normally a challenge, but you make it look so easy! I love your candy corn canisters. Love it! Your mantle is beautiful! Love your Mantel!! I featured it today on my Friday Favorites. Come check it out :) Happy Friday to you. I love your mantle! I found you through Six Sister's Stuff. Thanks for sharing! Cute candy corn vase! Your mantle looks fabulous:) I am a new follower! Great blog! I love the decorating ideas! I'm gonna have to try some of these! Thanks for linking up at Follower Fest! 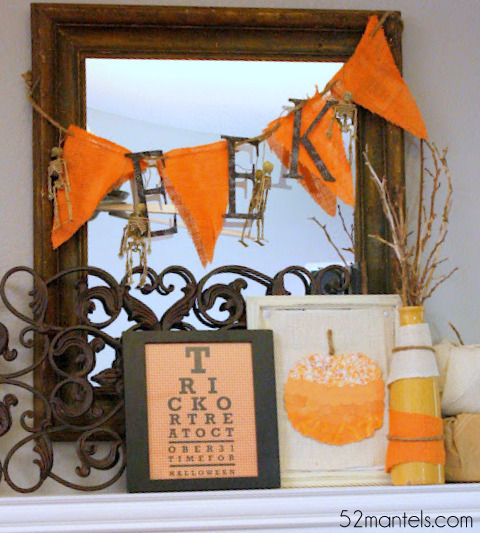 i love the eye chart printable!!! I just clicked over from the followers fest! happy halloween! Do you ever wonder why your Alexa Rank isn’t where you want it to be? Join Our Alexa Hop Get Your Alexa Rank DOWN! you how well it handles cold temperatures without gelling (solidifying). suggested that you use high mileage oil in any car with an engine that has over 75,000 miles on it.